Click the Start button, then open Control Panel. Open Network and Internet Connections, then click Internet Options. 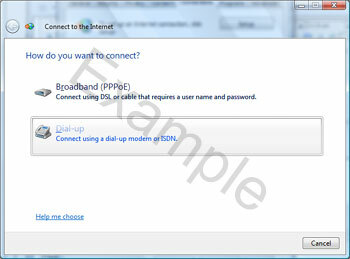 (If you do not see a Network and Internet Connections icon, simply double click the Internet Options icon). Under the General tab, type in www.toast.net/setup and click Apply. Enter your local Dial-up access number in the Dial-up phone number field. - User Name: full @toast.net email address. - Password: password is case sensative. Place a checkmark in Remember this password to save your password. Leave it unchecked for a more secure connection. 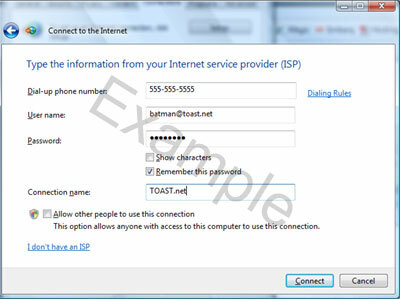 Enter TOAST.net as the Connection name. Click on the Connect button (even phone line is in use - this is required to create the connection). If the connection fails, choose Set Up The Connection Anyway. Once the connection is established, choose the option for Browse to the Internet or open the Internet Explorer browser from the Start menu. Follow the on screen setup instructions For the Windows setup program.